A short horror film "WHERE'S JULIE?". 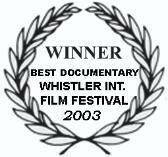 An official selection of the 2006 New York City Horror Film Festival. "Yukon filmmaker Matt Frame and his friends left home and trolled the Middle East, soliciting opinions from common folk about the impending war. Armed with a camera and microphon"
Last update : 16 07 2008 15:47:39.